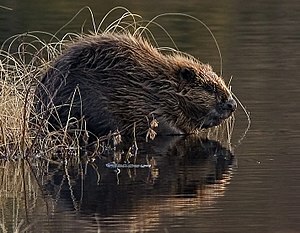 There are two species of beaver: the North American beaver (Castor canadensis) and the Eurasian beaver (Castor fiber). The Eurasian beaver is native to the UK and is the species involved in the Scottish Beaver Trial. Until the 16th Century, beavers lived throughout Scotland. They were hunted to extinction for their fur and a glandular oil (castoreum) secreted from the base of their tail containing medicinal properties. In medieval times, castoreum was used as treatment for headaches. Beavers are approximately the size of a tubby spaniel (25–30 kg), measuring 70–100 cm in length. Unusually for mammals, the female beaver is the same size or larger than males of the same age. They are uniquely adapted for a semi-aquatic lifestyle, with a sleek waterproof coat, large flattened muscular tail and webbed hind feet to provide propulsion underwater. At what age do beavers start breeding and do they hibernate? Beavers can live for 10–15 years, they mate for life and breed from the age of two, with one litter of 2–3 young (kits) each year. They are highly territorial and live in family groups, mainly in freshwater lochs and slow flowing rivers and burns. Beavers are crepuscular, rather than nocturnal, meaning they are most active at dawn and dusk throughout the year. They do not hibernate. Beavers are completely vegetarian. They do not eat fish but instead prefer to munch on aquatic plants, grasses and shrubs during the summer months and woody plants in winter. Beavers will often store food underwater so that they can access it if the water freezes over. In woodlands, beavers help to stimulate new growth by gnawing on tree stems and coppicing. This helps to breathe new life into tired forests and creates a diverse age range of trees which greatly benefits woodland management. Beavers sometimes build dams in rivers and construct lodges in the ponds created by their dams. Both beaver dams and lodges demonstrate remarkable architectural and water engineering talents. The dammed water forms a secure area around the lodge whilst also attracting other species such as frogs, toads, water voles, otters, dragonflies, birds and fish. Click here for more information about beavers, their habitat and the Scottish Beaver Trial.